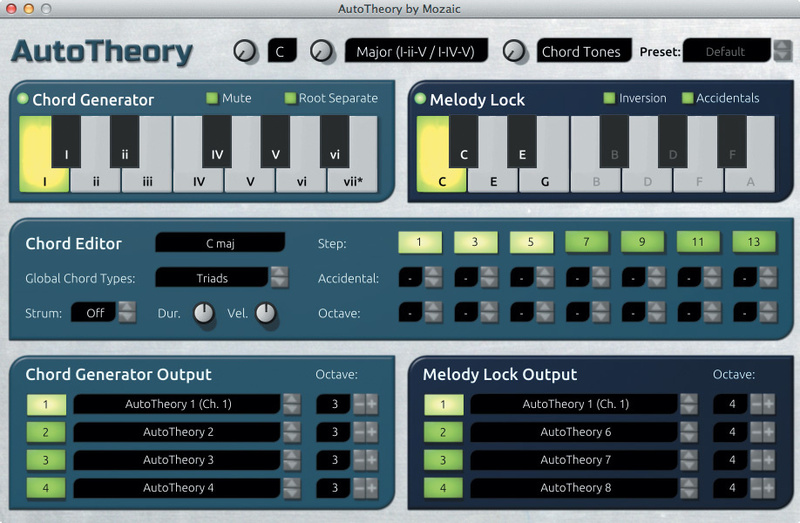 Mozaic Beats describe AutoTheory as an “open arpeggiation system”, and it has two main functions. First, to the left of a MIDI keyboard split point, you can map a set of chords for the currently selected key and then play any of these full chords simply by pressing the appropriate single MIDI key. Second, on the other (right-hand/high-pitch) side of the keyboard split, the software automatically adjusts the notes mapped to your keys so that they are confined to those available either within the currently triggered chord or an associated scale. Within this zone, the note generated by a particular key changes as you trigger different chords. In practice, what this means is that you can leave the fingers of your right hand poised over the same five keys on your MIDI keyboard and, based on the chord you trigger with a single finger of your left hand, whichever notes you hit with your right will be harmonically ‘correct’ given the current chord. No more fluffed chords and no more out-of-key melody notes. And this is, of course, where the “open arpeggiation system” concept comes from, as you could play an identical finger pattern with your right hand but the MIDI notes generated would change in response to the chords your left hand triggers. The end result will be a perfect arpeggio pattern from your right-hand playing. You can, of course, vary your right-hand note pattern to vary the nature of the arpeggio. 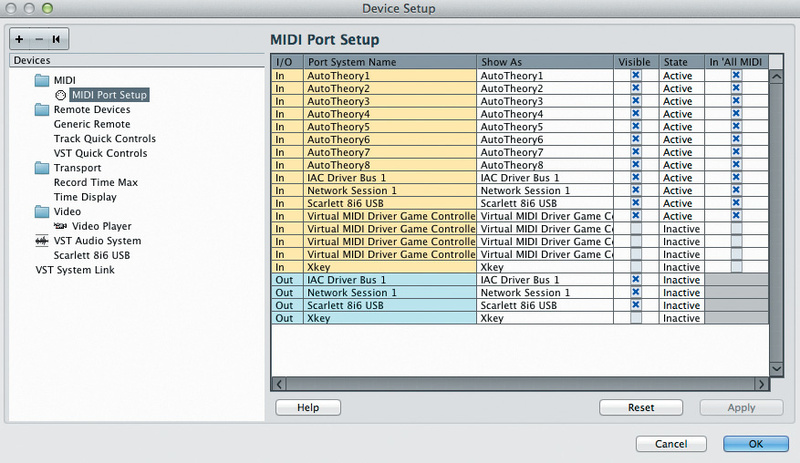 AutoTheory provides eight virtual MIDI outputs for your DAW/sequencer to use, as shown here within Cubase.Once installed and authorised, AutoTheory simply runs alongside your DAW/sequencer software. The only initial configuration to be dealt with is to ensure that the MIDI connection with your MIDI controller keyboard is disabled in the DAW and set as the MIDI input into AutoTheory. In essence, MIDI data from your keyboard is routed to AutoTheory and, once remapped by AutoTheory’s settings, the resulting MIDI data is then passed on to the DAW/sequencer via any of the eight virtual MIDI ports created by AutoTheory. I had no configuration issues within Cubase on my test system and there are simple instructions on the Mozaic Beats web site that illustrate the setup process for a number of the other common DAW packages. It should, in principle, work will almost any MIDI sequencer, providing you can control which MIDI inputs are active. AutoTheory’s interface is split into five zones. The upper strip contains controls to set the key, scale and the ‘mapping’. The first two are fairly straightforward, while the latter produces gradually more complex (flexible?) note mappings in the right-hand melody zone of your keyboard. These range from restricting the notes to just those within the currently selected chord right through to all the notes within the chosen key/scale; the choice is therefore yours depending upon the level of control you want. There is also a preset system in the upper strip where you can save your own configurations. The two boxes below hold additional settings for the Chord Generator (left hand) and Melody Lock (right hand). 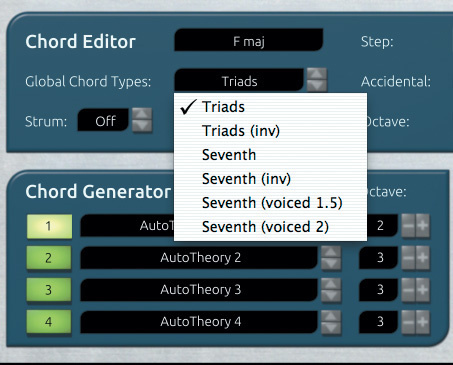 The Chord Generator shows the mapping of the current chords across the keyboard so, if you hit a ‘C’ note, then you get a ‘I’ (tonic) chord in the current key/scale combination, and so on. This pattern of chords is repeated as you progress further to the left of the keyboard and the chords are generated in the appropriate octave. 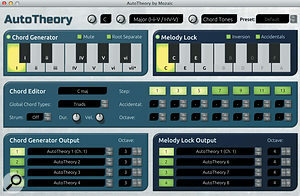 AutoTheory provides a number of global chord settings that you can use as a starting point for building your own presets.You can choose to mute the MIDI output from the Chord Generator, in which case the chord triggered here simply controls what happens within the Melody Lock mapping. In addition, the Root Separate switch allows to you send the chord’s root note out to a separate MIDI destination. 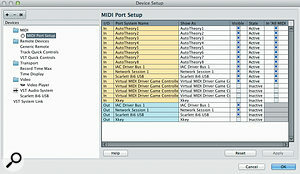 As described below, the MIDI output for the root note can be selected in the Chord Generator Output panel at the bottom of the window. In practice, then, you can use AutoTheory as a means of playing chords, as a means of simplifying melody parts based on chords, or to generate both at the same time. With the Mapping control set to Chord Tones it’s essentially impossible to hit a duff note. While that perhaps means you don’t have the freedom to create melodic lines that are more harmonically interesting, it is still a satisfying experience for those with limited piano skills — and for some musical genres, simple melodic forms work best anyway. There are alternatives to AutoTheory, and a number of the major DAW/sequencers include some sort of ‘auto chord’ feature. For example, Cubase includes the Chorder MIDI plug-in and, as explained in the November 2013 Cubase workshop, you can also use the Chord Track to transform your random keyboard doodling into something more coherent. Both of these are, however, more complex to configure than AutoTheory. Perhaps a closer comparison is with the various MIDI performance apps that are available for iOS (and which can send MIDI data to your desktop virtual instruments) such as Chordion, ChordPolyPad or SoundPrism Pro. All of these allow you to trigger full chords using a single finger and each also offers the ability to add melody or bass lines that are harmonically correct. The apps themselves are pocket-money priced but you do, of course, also need access to a suitable iOS device such as an iPad or iPhone. 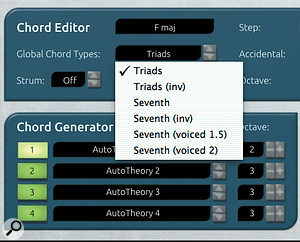 Allows even non-musicians to create credible MIDI chord and melody parts. At the current price, very good value. It might be nice to be able to define your own scale tones for melody construction. Some might say it’s cheating! If you have musical ideas in your head but lack the keyboard skills to realise them, AutoTheory can sit between your MIDI keyboard and MIDI sequencer and help you create them. A neat little utility and, at the current price, very good value. Tested with Steinberg Cubase 7.5.20.